Flash and a wee princess. Links about Eric Hall and HEROIC Inc.
My Life as an Action Figure Pictures - Eric shows how he uses action figures to inspire his cosplay designs. HEROIC website - HEROIC, Inc. (Heroes Engaging Real Organizations in Charity) is a group of Super Cosplayers who support charity and awareness events. They will be featured later in the year so keep an eye out for them! They really embody "Cause"-play. If you could pick any super power to have which would you pick? My favorite hero is Green Lantern, so I've got to go with a power ring-- because it can do anything its user imagines. I like the flexibility of creating objects, translating languages, hyperluminal flight, shields, energy blasts, phasing through matter... Anything the user wants to do. 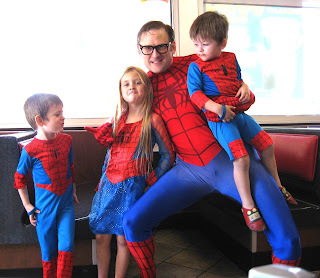 What is it like being a Super Dad to your children? 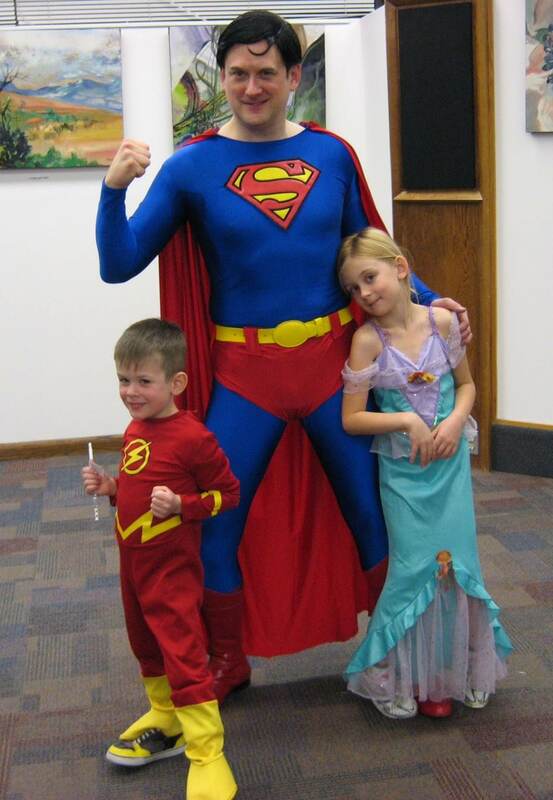 I don't know that I'm a super dad, but it's being able to dress up with them at costume events. I go to school on Halloween with them (in the past as Superman and the Green Goblin) to help with their class parties and costume parade, go trick or treating with them, and attend other costume events including some conventions throughout the year. I made a Star Sapphire costume for our daughter, and my wife has made all of the kids Borg outfits, and a Lal (Data's daughter) and a Seven of Nine costume for our daughter. 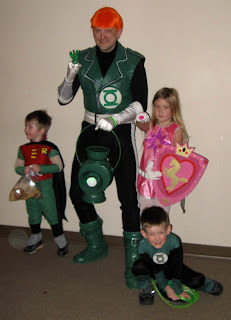 I feel a sense of pride when my oldest son wants to dress like Green Lantern too, because he knows he's my favorite character. Now that they've grown a bit, I'm working on some new, larger Borg costumes for the boys. As thrift stores start to put out their Halloween costumes in August and September, I go to see if there are hero or Star Trek costumes for the kids. I've found Wonder Woman, Supergirl, Batgirl, Green Lantern, Superman, Robin, the Flash, Batman, and lots of kids size Star Trek uniforms. Shopping after Halloween sales at Target, Walmart, etc. and the temporary Halloween stores yields good costumes and accessories at great prices, too. If your children picked a super power for you, what would they pick? Our daughter would probably want me to turn into a kitty-- she just got a kitten and loves to play with her. Our oldest son loves to read and do math problems, so he would want me to have super-computing powers to answer his questions. Our second oldest son loves for me to lift him up and make him fly, so for him, super strength or flight. And our 8-month old likes to be held and to play with soft toys, so maybe snuggle power or chewy toy creation. 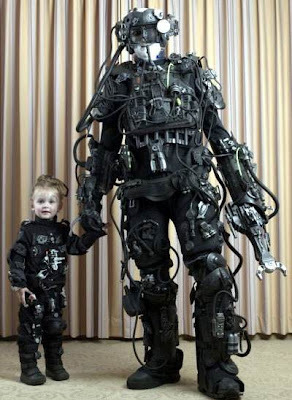 Eric and daughter as Borg. I have always loved Halloween. When I was nine I used blue food coloring to turn my face and hands blue so I could go trick or treating as Desslok from the anime series "Star Blazers/Space Battleship Yamato". It took several days for it to wash off, so I wouldn't recommend that technique. The following year, I made a robot costume out of some boxes, empty bleach bottles, and dryer hose that I spray painted silver. To get to my school's Halloween party, I had to put it on and lay on my back in the bed of my dad's pickup truck. That was the first costume contest that I won, and after that, costuming became one of my favorite hobbies. My mom made my first Star Trek uniform for me when I was 17, and I made my first Green Lantern costume from some green shorts and a green tank top over some black parachute pants and a black turtleneck when I was 18. I started to cosplay just for fun and as a release for my creativity. I am a HUGE Star Trek fan, and I had people at work, random cashiers at the store, etc. 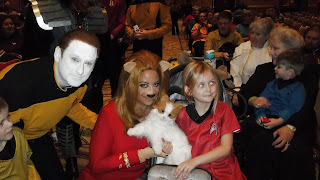 tell me that I "look like that Robot guy from Star Trek", Mr. Data, so I bought a uniform and started to go as Mr. Data to Star Trek conventions. At about the same time, I began working on my Borg costume. 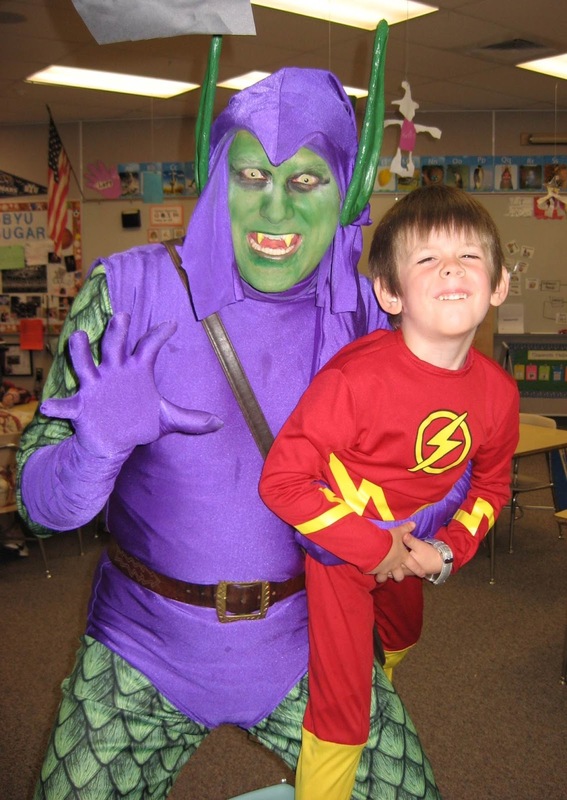 I branched out in about 2005 into Superhero cosplay, when I started with Spider-Man, Superman, and Green Lantern. I attended my first comic convention, the Emerald City Comicon, in 2008. 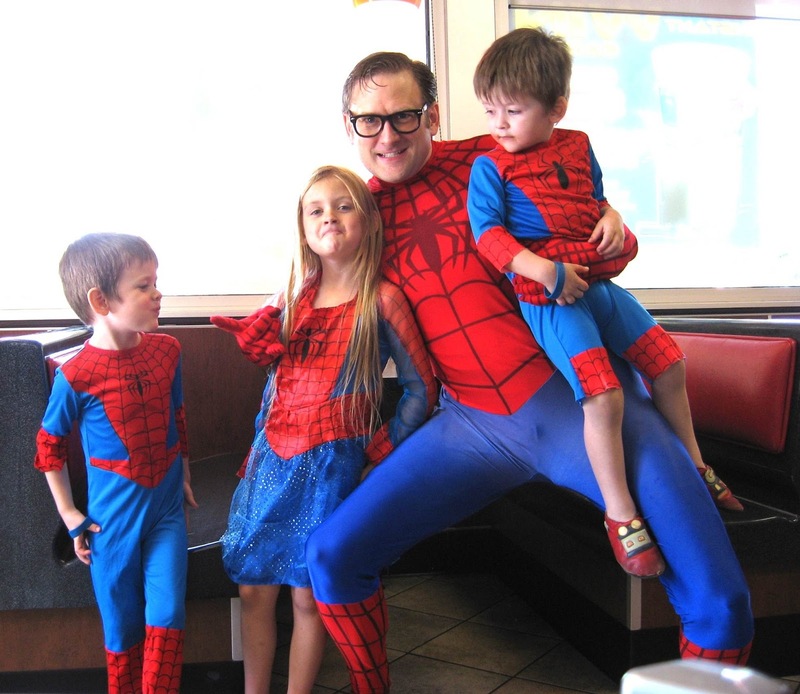 My interest in comics cosplay led me to appearances at Free Comic Book Day, and charitable events for the MDA, Toys For Tots, the Make A Wish Foundation, and some events to raise funds for pediatric cancer research. THAT led me to an invitation to become a founding member of HEROIC, Inc., a Superhero costuming charity organization based in Salt Lake City, where I live. 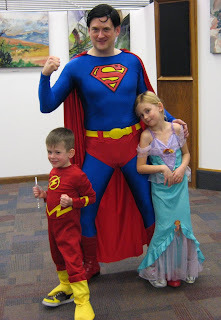 Now, most of my costuming appearances are with HEROIC, Inc. in conjunction with supporting charitable or community events. How many cosplays have you done over the years? I don't have an exact count, but I'd estimate about 120 or so. Some "base" costumes can be accessorized to create new ones; I have leather pants and a jacket that can be used for Elvis, the Terminator, Mad Max, or Ghost Rider, for example. My "Top 50" include a Borg, Lore from "Descent", Lore from "Brothers", Mr. Data in TNG uniform, Data in FC uniform, Data as Carlos from South America, Data as Jayden the Iceman, Data as Sherlock Holmes, Data as Frank Hollander, Captain Kirk in gold uniform, Captain Kirk in green casual tunic, Captain Kirk in Wrath of Khan uniform, Enterprise Era Andorian, TOS Andorian, Zombie Redshirt, movie version Nightcrawler, Ghost Rider, Green Goblin, Spider-Man, black suit Spider-Man, Guy Gardner, Hal Jordan, Kyle Rayner, Superman, new 52 Superman, Batman, animated series Joker, Dark Knight Joker, Captain Atom, Desslok, young Obi-Wan Kenobi, Luke Skywalker X-Wing pilot, Shaggy, Professor Snape, Remus Lupin, the 10th Doctor, the 11th Doctor, Fox Mulder, Roger Moore James Bond, Aragorn, Jack Sparrow, Zorro, V from V for Vendetta, Indiana Jones, Mad Max, The Terminator, Elvis, Eddie Munster, Angus Young, Anubis, Daniel Jackson, Peter Pan, Dracula, the Wolfman, the Riddler, Green Arrow, Aquaman, Thor, the Hulk, and the Red Skull. How long does it take for you to make a cosplay? It really depends on the cosplay. I've been working on my Borg since 1993-- I upgrade it and change out parts every year. Some cosplays I buy, like my Green Lantern or Star Trek uniforms. I typically find items at thrift stores and "assemble" my costumes, rather than make them from scratch. My Guy Gardner took about a month of an hour or so a day to become complete. I found a leather jacket at a thrift store and unstitched the arms to make the vest. I spray painted the vest green, and then used paint markers to do the black and white trim detail around the lapels. I found two white belts at at thrift store and stitched them together to add the belt to the bottom of the vest. I printed a Green Lantern logo on my computer and cut it out, and used it as a template on some green craft foam to make the chest logo, and then glued it to a round piece of white leather, and then glued that to the jacket. I found a black spandex workout shirt, a Dickie, and baseball pants at a thrift store that I could use as-is. I also found white opera gloves and some smaller white belts at a thrift store that I sewed onto the gloves. I found some moon boots at a thrift store, and some green belts that I sewed onto the boots to replicate his boots look. I made the power battery from a plastic cookie jar, two Kool Whip containers, two Tupperware bowls, and an embroidery hoop, all from thrift stores, and all spray painted green. I use my small green plasma disc from my Borg outfit for the power battery on one side, and some green Christmas lights from Ikea inside of a translucent cup on the other side. The ring was a giveaway with a comic book. The wig was from a clearance sale at FYE that I cut and styled. Planning is really important; I have just finished my latest costume, Data as Frank Hollander from the episode "A Fistful of Datas", about two weeks before the annual Las Vegas Star Trek convention. I started planning it a year ago-- I had the hat and pants, but as I browsed thrift stores, I looked for black cowboy boots, an overcoat, a gunbelt, a toy gun, and a shirt like he wore in the episode. I found a nice fake moustache at an after-Halloween sale for 75% off. Instead of rushing and trying to throw things together right before a convention, I try to plan ahead and gather what I need over time. Out of all the fandoms you have cosplayed, which is your favorite? That's a hard question... If I had to choose, it would be Star Trek, but cosplaying superheroes (and villians!) as a part of HEROIC, Inc. has been spiritually rewarding, besides being fun. What is the best part about attending a convention with your family? Seeing the kids enjoy themselves in their costumes, and the attention they get. As a family, we met and were interviewed by William Shatner for a documentary he produced called "William Shatner's Get A Life". 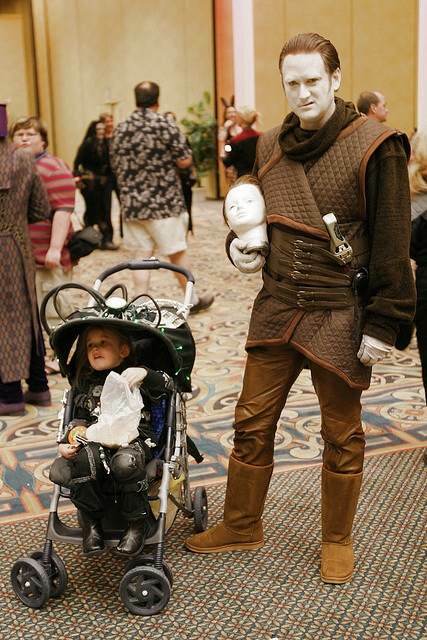 The kids were dressed like Borg, my wife was in a Starfleet uniform, and I was dressed as Data's evil brother, Lore. A film crew came to our home for a day a couple of months after the convention and interviewed us all again. One year at the convention, on the day we went home, our oldest son Allan climbed into his stroller and said, "Ready to go!" -- he was excited to dress up and go back down to the convention from our hotel room and watch everyone else in costume, too. You can find the film completed here on Netflix and Eric is the amazing Borg in the video: "Shatner's: Get a Life"
1. Bring the kids something to do-- coloring books, a ball to play with, toys, a tablet or quiet game-- going to a an hour long panel might be fun and interesting to you, but will quickly bore little kids. And then walk around and look at things, like the dealers room, visit the restroom, etc. to break up the day for your kids, so they're not just sitting for three hours straight in the same panel room. 2. Bring snacks like granola bars, fruit snacks, raisins, etc. 3. Plan YOUR costume wisely. A lot of my costumes have removable gloves, like Green Lantern, Green Goblin, Data, etc. This is helpful when taking little ones to the restroom or changing really little ones' diapers. I use costumes with non-removable gloves like Spider-Man, Captain Atom, etc. only when I don't have the kids with me. Also if your kids are little and like to grab things, beware of necklaces, ties, earrings, feathers, etc., white clothing or clothing that's difficult or expensive to clean. 4.You can suggest or try to guide the costumes your kids wear, but ultimately they will be happier in something they want to wear.